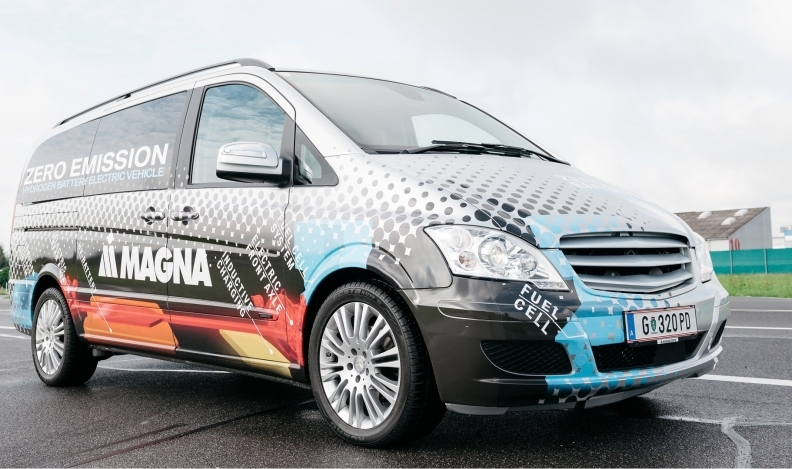 Magna first revealed the fuel cell range-extended electric vehicle (FCREEV) in March at the Geneva auto show. Magna International’s new hydrogen fuel cell and battery electric hybrid platform is right on trend with the direction fuel cell vehicles are headed, one expert says. Renewable-energy consultant Geoff Budd told Automotive News Canada that other automakers and suppliers increasingly see the fuel cell/battery combination as a way to balance range requirements with speedy refuelling. Battery and fuel cell stacks can be sized according to a vehicle’s mission, said Budd, whose past work includes fuel cell development with Ballard Power Systems and Daimler-Benz. Budd sits on the board of the Canadian Hydrogen and Fuel Cell Association. Magna Steyr Engineering, a unit of the Canada-based auto-parts giant, created a range extender fuel cell/battery hybrid (FCREEV) at its facility in Graz, Austria. Its partners were fuel cell developer Proton Motor of Germany, two Austria-based research institutes and the Austrian government, which provided funding. The vehicle, converted from a conventional range-extender hybrid minivan, can operate in different modes to optimize the system, depending on its state of charge and on the kind of driving. Combining two sources of electric power allows the design to reduce the size and weight of the battery and the fuel cell stack, offering both rapid battery recharging and hydrogen refuelling capabilities. “We see from this approach that in terms of costs and performance we have key benefits for the end user,” Guido Bartlok, Magna Steyr’s hydrogen systems manager, told the Hydrogen Fuel Cell Conference in Vancouver in June. Magna has developed fuel cell components before, he said, but this was the first time it has integrated such a system into a vehicle. The fuel cell range extender vehicle addresses one main criticism of battery EVs as long-range zero-emission vehicles: the lengthy recharge time. Other impediments remain: Both recharging and hydrogen refuelling outlets are still sparse, and the vehicles themselves still cost more than their conventional equivalents to own. Budd said Magna’s concept is part of an industry trend away from pure fuel cell propulsion to some combination of fuel cell and battery power. Ballard, for example, is in a joint venture with a company in China to produce range-extender fuel cell buses for its domestic market. The French company Symbio FCell is testing a Renault Kangoo zero-emission plug-in hybrid commercial van with a range of more than 300 kilometres. Meanwhile, Daimler plans this year to roll out a Mercedes-Benz GLC fuel cell/ battery plug-in hybrid utility vehicle with a promised range of about 500 kilometres, claiming it will be the first such vehicle in regular production. Budd says that other automotive-component suppliers such as Robert Bosch and Siemens are working on fuel cell/battery hybrid systems. Hybrids have important advantages over pure fuel cell platforms, he said. The size of the fuel cell stack, hydrogen storage tank and battery can be varied according to how the vehicle will be used. A vehicle with a lot of downtime that can be plugged in overnight will need a smaller fuel cell for extended range. Those in constant service will benefit from a larger fuel cell unit and quick refuelling, versus charging. “It really is an issue of what do you need the vehicle to do,” said Budd. Batteries also offer efficiency benefits, such as the ability to recover energy through regenerative braking. “It really doesn’t pay,” to use a fuel cell alone, Budd said. Bartlok told the conference that besides allowing for faster inter-city trips, Magna’s FCREEV could be used in other roles where long range and fast refueling are important, such as for taxi and shuttle services. The company has no plans to produce the FCREEV independently, he told Automotive News Canada. Magna Steyr produces about 200,000 vehicles a year at its Steyr assembly plant, making it the world’s biggest unbranded car manufacturer, Bartlok said.